Below is a blog from Mikayla Bayer (a freshmen at West Liberty) about stepping out of her comfort zone to lead a Bible Study on campus. I think that was one of the biggest things that I was looking for when I came to West Liberty. I wanted to surround myself with a great Christian community. When I first arrived in the fall, I made some awesome friends and found myself attending C3 on Sunday mornings. Eventually I was attending C3's College Ministry as well. This was such an amazing experience for me since I only have ever been a part of one church, but somehow I knew that this was the great community God wanted for me - just like the one I had back home and just like the one He wanted me to have on my campus. When I was first approached about starting a Bible study with my friend Olivia, I was nervous. Many thoughts were running through my head... "I'm not spiritual enough", "I don't know my Bible well enough", "I don't know how to lead people." I'm more than happy for the push Sarah Smith gave me to ignore the doubt in my head and go for it with God at the center. He has amazingly blessed me with the ability to start and lead this with Olivia. 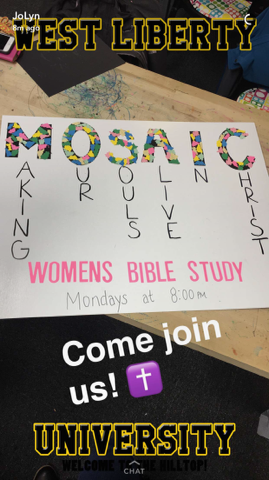 This semester we have officially started the Bible study we call MOSAIC (Making Our Souls Alive In Christ). Two churches graciously donated the books and journals, called "Do You Think I'm Beautiful?" by Angela Thomas. It's a book based around the questions women ask and how these questions can help them find their identity through their loving Creator. It has been a perfect fit for the group we have. We currently have around 12 girls that come very Monday night where we discuss the chapter we read and the questions we answered. There are no wrong answers, nothing that can't be said, and a lot of encouraged discussion. 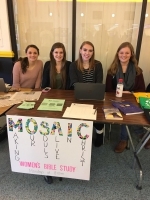 We are also in the process of becoming a club at West Liberty, which I hope will help bring God's love to more girls on campus. This experience has been one of learning and growing for me. I have learned so much about the God I love, not only through Bible study, but through the fire that this Bible study has stirred in me. I find myself more driven to learn about God and more inspired. I want to tell everyone that I LOVE GOD! I want everyone to know that he is there and he is always there. This is something that I never used to have the courage to do. God has pushed me outside my comfort zone and I don't want to go back. I was so worried that I wouldn't say the right things in the Bible study, but I have created so many loving bonds with every single one of those girls that I know that God put me here to grow WITH them. I have found my community. I love every single one of those girls so much and I pray that God will continue to use me at West Liberty so I can have an even larger community to love.